Plastic rail joiners do not conduct electricity from one rail to the next; metals ones do. Yes, plastic is used to isolate spurs, reversing loops, and block detection. Plastic joiners can be thought of as “gapping” the track where needed while giving mechanical integrity to keeping the rails aligned. Metal joiners are stronger, and serve to act as actial “fishplates” for joining track. some like to solder their joiners, I prefer not too. For DCC just install dropper lines from each section of track down thru the deck to your DCC buss line. This gives increased integrity to your power around the track and bypasses any joiners that my not be secured to the rail or causing a high resistance. Not, at the end of your buss wire, install a “snubber” of a resister and capacitor across the lines to eliminate random noise or spikes on the line. It has been known to snap on your power and send erroneous signals down the rails, causing your decoders to jump into action with a run away loco. Metal rail joiners conduct electricity from one rail to another. A section of track is known as a block. Plastic rail joiners do not conduct electricity. They are used to isolate sections (blocks) of track in DC circuits. 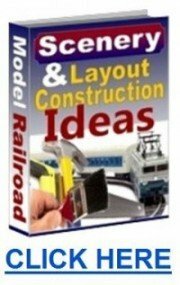 For instance you would use plastic to isolate sidings and rail yards so you can park a locomotive and move another locomotive around it on another block. Each block is wired to a switch (double pole) in a control panel. You throw the switch and the locomotive starts moving along with the cars behind it. Turnouts are AC and must be wired separately; a switch (double pole momentary) for each turnout. You can also solder your metal joiners to the rails to keep a good connection of power. Practice with a scrap peace of track if you decide to do this. Be careful not to overheat the joint and melting the plastic ties. I use a Weller soldering pencil with a setting of 3 on the heat control. Works great. Just read your comment about soldering. Can’t find any info under Weller soldering PENCIL. Is there any other name for it? Look under soldering station. Make sure it has a heat control built in. You might need to purchase the pointed soldering tip made by Weller. Also, make sure you solder to the outside of the rail, not the inside. The reason not to solder on the inside is that if you leave a lump of solder, the flange on the wheels will, most likely, hit it and force a derailment when it hits it. With practice, one can make a smooth joint preventing that problem. 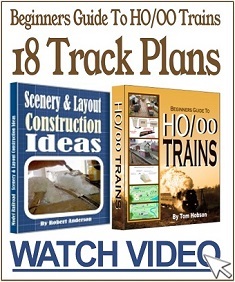 I am getting ready to build a HO layout. I built a 4′ X 6″ layout to learn how to work these layouts. I am now going to build a 16′ x 4″. One of the things I am pondering is DCC. What all is required and how do you install a DCC controller. As i think it is you install something in the locomotive and have a hand healed control unit. 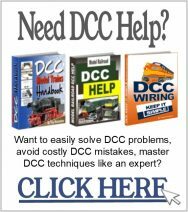 Can the DCC be installed in any locomotive or are there only some that can be installed in? Do you have to wire the track different than DC? 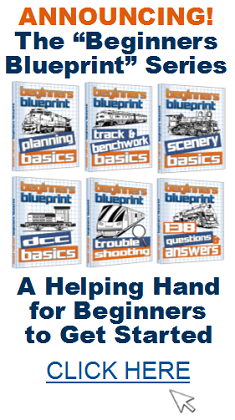 To start with, you need a DCC decoder in every locomotive you plan to run on the layout and a DCC controller. Installing the decoder can be straightforward if the locomotive is advertised as ‘DCC Ready’ or similar. All you need to do is to look in the locomotive instructions to find out what type of decoder you need and then it’s just a case of removing the body (again, the instructions should show you how to do this) and installing the decoder. If you’re not confident doing this or have an older locomotive without a decoder socket, then your local dealer should be able to either fit it for you or put you in touch with someone who can. As for the wiring, the main difference between DCC and DC is that, in DCC the whole layout is live at all times with no isolating sections. In its simplest form, you only need two wires from the controller to the track but, in reality, it’ll be more than two wires if you’ve got sidings and loops. DCC also permits point and accessory control, reverse loops, sound, computer control and a host of other things but these complicate things somewhat so you’re better just starting with the basics and then adding other things in as you get more confident. or 18 vols at all times and the controller talks to a chip Metal joiners keep rail aligned and allow electricity to flow. Plastic joiners keep rails aligned but isolate them from each other electrically. 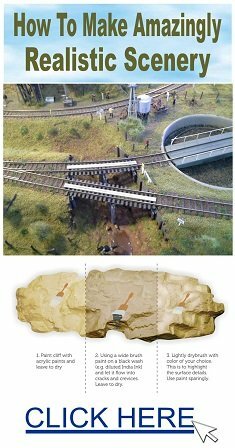 There are many occasions where rails must be isolated (e.g at points or for creating electrical blocks to hold trains on DC layouts). If the rails are not secured they will drop out of alignment causing derailments or rejoin the gap. With plastic joiners both problems are cured. As for the DCC issues, DC wired layouts are very easily converted to DCC with very little trouble, and can be returned to DC quite easily also. DCC runs 16 or 18 volts full time and the controller talks to the chip installed in the loco.